Animal Friends in action "Thousand Kilometers for Countless Lives"
Obligation for every local community to build a shelter for abandoned animals is regulated by the Croatian Animal Protection Act, but at the moment most of the shelters don't deserve to call themselves shelters because they kill the dogs and don't conduct by the law regulated obligation to mark the dogs and try to find them a home, and educate people in order to popularize adoption of animals, and prevent abandonment. Registered shelters use a possibility given by the law that allows killing abandoned animals 60 days after they came to shelter, instead of trying to find them a new home. 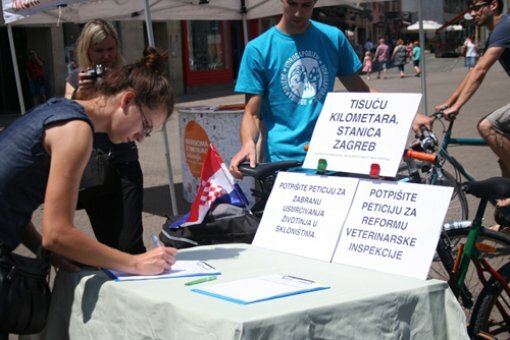 Only four cities in whole Croatia – Zagreb, Cakovec, Ivanec and Dubrovnik – have decided to solve the problem of abandoned animals by public actions, cooperating with volunteers and organizations and education of the whole community, and not by killing. Animal Friends organization is highlighting that in accordance with contemporary ethic principles and Animal Protection Act the regulation which allows healthy animals to be killed must be urgently deleted from the law, and animal shelters should become the places of education, empathy and communion for the whole community, and not scaffolds for abandoned animals. Due to the given reasons Animal Friends has started an action for deleting this regulative from the law. Many organizations and individuals have joined the action within the Network Against Animal Abandoning. Therefore Animal Friends supports the project of Victories association from Osijek, which holds a human animal shelter and cares for the dogs by seeking future homes for them, and doesn't kill them no metter how many days they have spent in the shelter. Volunteers of Victories have started a project called "Thousand Kilometers for Countless Lives," in order to stop unnecessary killing of animals which ended on the street because of the humans. Two volunteers of Victories association, Kruno Lubina and Filip Krstanovic have started cycling from Osijek and will end in Dubrovnik. The journey is thematic planned as a big story with carefully chosen stops – Virovitica, Zagreb, Zadar, Split, and finally Dubrovnik. In the cooperation with local organizations, shelters, media and individuals, in these cities will be organized info booths and signing the petition to reform veterinary inspection. On June 20, 2012 Animal Friends will welcome the bicyclists on they journey through Zagreb. 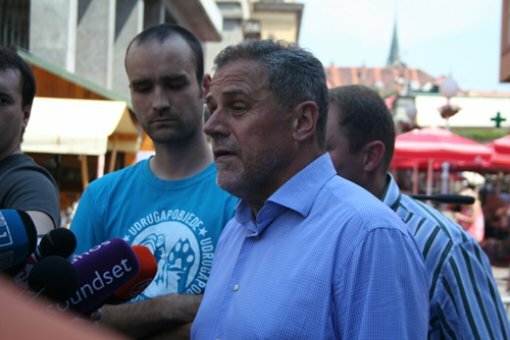 A mayor of Zagreb, Milan Bandic will welcome them at 11:15 A.M. on the main city square and share the experiences of Zagreb as the example of humanly way of taking care of the animals, by education and adopting, not killing. Animal Friends will join the bicyclists on the same place at 1 P.M. and organize signing of petition to forbid killing animals in shelters, as well as to reform veterinary inspection because of the latest horrible actions of veterinary inspectors in Dumovec and Noah's Ark. Two dogs adopted from Dumovec shelter will also join the bicyclists on the main square. Mr. Emil Tuk, head of City Office for Agriculture and Forestry is also expected to come. Organizations Animal Friends and Victories are also inviting citizens to join the protest on Trg bana Jelacica in Zagreb on June 22, 2012 at 1 P.M. in order to stop killing healthy animals by veterinary inspectors and urgent re-opening of shelters, in which there isn't nor wasn't virus of rabies.